Four rising professionals recently completed a training program in oyster aquaculture at the Virginia Institute of Marine Science, providing them with the skills needed to advance in this rapidly growing industry. Led by Professor Stan Allen, Director of VIMS’ Aquaculture Genetics & Breeding Technology Center (ABC), VIMS’ Oyster Aquaculture Training (OAT) certificate program targets those pursuing managerial or technical careers in all aspects of oyster aquaculture, from hatchery operations to grow-out and processing. The graduates of this year’s program, which ran from April to September, are Imani Black, Haley Ladeau, Lizzy Profita, and Chris Rubino. Ladeau says the skills she’s learned from ABC staff have been invaluable. “They really show you and explain to you the techniques used in all aspects of aquaculture,” she says. “Everything you learn in this program is important.” Since graduating, Ladeau has stayed on with the ABC program as a field technician while interviewing for prospective positions. 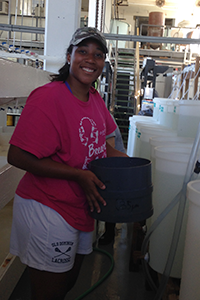 Profita first caught the aquaculture bug as an undergraduate at the University of Hawaii at Manoa studying algae, oysters, and shrimp. 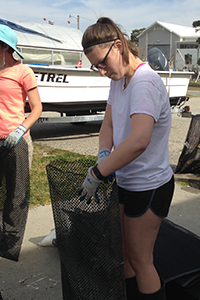 After completing an assignment with AmeriCorps Cape Cod in Massachusetts assisting a town shellfish constable, she applied to the OAT program in hopes of taking the next step in her career. She says a program highlight was the opportunity for externships at local commercial aquaculture operations. “The tours we went on opened up the range of possible careers after the OAT program, not just a farm or hatchery job,” says Profita. Rubino was drawn to the OAT program after working at the University of Maryland’s Horn Point Oyster Hatchery. “VIMS’ ABC is the pinnacle of oyster genetics on the East Coast, maybe the world, and that wealth of knowledge brought me here,” he says. Rubino’s OAT experience included assisting VIMS master’s student Joey Matt in his study of oyster genetics, and sampling oysters from commercial farms on the Eastern Shore. “I learned a great deal about lab techniques and research methods in my processing of hundreds of oysters for histology and near-infrared spectroscopy,” says Rubino. Both Allen and Chesler say they take pride in the benefits that OAT graduates offer to local industry. “We have three OAT alumni that are working for Cherrystone Aqua-Farms on the Eastern Shore, and two work at Ward Oyster Company that’s just right up the road,” says Chesler. Expanding beyond the current OAT program, Allen has worked with educators at the MathScience Innovation Center in Richmond to create a high school version called the Student Pursuing Aquaculture Training (SPAT) program. After completing a two-week aquaculture course at the Center, four students are chosen to spend a week at VIMS for hands-on training. “Two students came for one week, two came the next week, and our OATs participated in training them,” says Allen. Allen’s focus for the short term, though, is ensuring the OAT program’s continued viability. “We’re trying to make the OAT program sustainable, and that is where our future vision is located,” he says.